What are some common first time home buyer mistakes to avoid in NYC? Should you consult your real estate agent friends for advice or is it better to avoid them? We’ll go over some common first time home buyer mistakes to avoid in NYC and highlight some lesser known errors that can cost you significant losses in the future. Before you rush off to speak with your real estate agent friends, read this first! Should I hire my friend as my buyer’s agent in NYC? Should I assume that the listed square footage is correct in NYC? Should I trust my lawyer to handle all of the due diligence in NYC? Should I figure out what closing costs in NYC are before making an offer? Should I work with a discount broker in NYC who will give me a rebate? Should I consider listings in NYC that have been on the market longer? No. Stop and think first before choosing an adviser for the biggest purchase of your life. One of the easiest first time home buyer mistakes to avoid in NYC is being guilt tripped into working with one of your real estate agent friends. Not only will this cost you the opportunity to earn a broker commission rebate, but your friend could cost you significantly more from poor advice, misaligned incentives and a general lack of knowledge. Not to say that real estate agents can’t be true friends, but please also remember that their primary source of new clients is through networking and referrals. As a result, your friendship and their social calendar is their primary source of income. If you’re not careful, it’ll be very easy for them to persuade you to work with them. They’ll tell you that it’s free to have a buyer’s agent because their commission is split from the listing agent’s commission which the seller always pays. And since it’s free, why not pick them because they’re your friend? What’s worse is that most first time home buyers in NYC will approach one of their agent friends for advice at the beginning of their search. Why? Please remember that these enterprising agents have been posing as industry experts at all of the social gatherings you’ve attended together. It would be natural for you to approach them for advice at the next party you attend. Fact: Your buyer’s agent friend will earn 3% of the sale price in commission! The typical real estate commission in NYC is 6% of the sale price, payable by the seller at closing. The commission is co-broked by the listing agent and shared equally with a buyer’s agent, if the buyer chose to have representation. So don’t ever be duped by your agent friend that he is helping you as a favor for free. That’s simply not the case. You are ultimately paying for the commission as you are the one purchasing the house right? Therefore, do not let your agent friend pretend that you’re just doing him a small favor that doesn’t cost you anything. Nothing could be further from the truth. By choosing your friend as your buyer’s agent, you’re handing him 3% of your purchase price in commission! In NYC where the average apartment sells for $2 million, that’s a $60,000 payout for your friend! Absolutely not. Common first time home mistakes to avoid in NYC include blindly assuming that the square footage advertised is correct. The sad truth is, square footage is often exaggerated even for condo apartments which are much easier to fact check than co-op apartments where the square footage is usually a mystery. An inexperienced buyer’s agent will not be able to tell you how to verify an apartment’s square footage. Their advice will be to simply visit the apartment and gauge it versus other ones you’ve seen, or to just “eyeball” it or feel if it’s as big as advertised. None of this is helpful if you eyeball it wrong and have to deal with the consequences later when you need to sell. A veteran buyer’s broker will be able to tell you that condo square footage is relatively easy to verify. They’ll explain that you can see what the NYC Department of Finance believes the square footage is from the condo’s “Notice of Market Value” which is publicly available online. Your lawyer will also be able to check the square footage listed in the original offering plan during legal and financial due diligence. An experienced buyer’s agent will also be able to explain to you the difference between net and gross square footage. Net square footage is typically defined as interior square footage or usable square footage, i.e. the space inside of the exterior walls. However, new developments will often aggressively include not just the wall space but also common areas into its square footage calculations. Note: it is fairly common for condo owners to include 100% of unshared wall space and 50% of shared wall space into their listed square footage. After all, if 2 neighboring units were combined and the interior shared walls removed, the wall space would indeed become usable square footage. No. Even though lawyers traditionally handle both legal and financial due diligence on behalf of their buyer clients in NYC, it’s a common first time home buyer mistake to assume they’ll be extremely thorough in their research. Even though lawyers have a fiduciary duty to serve your best interests, the fact of the matter is they are only getting paid a flat fee of typically two to three thousand dollars for the transaction. As a result, relying completely on someone who isn’t nearly as invested as you in the transaction is not a good idea. If you have a veteran buyer’s broker by your side, he or she will be able to guide you through some common potholes to watch out for. A good buyer’s broker will give you suggestions on what to diligence yourself so you can double check your attorney’s work. For example, you should at least read and understand the mortgage contingency clause of the contract to see what your lawyer has negotiated for you. You can see how much time you have before the contingency automatically expires, and you can see if your lawyer has negotiated minimum loan amount language on your behalf. You can also check if an appraisal contingency has been negotiated on your behalf. Absolutely. A common first time home buyer mistake to avoid is forgetting to ask your buyer’s agent what closing costs are. Most first time home buyers won’t even think about closing costs until it’s too late. And most buyer’s agents barely have any idea of what closing costs in NYC are to begin with. That’s why you have to be very careful on who you choose to represent you on such an important life transaction. In contrast, a veteran buyer’s agent will give you an idea of what normal closing costs are beforehand and will also be able to inform you that closing costs for new developments are typically higher. A good buyer’s agent will tell you before you put an offer in on a sponsor unit that the sponsor will typically ask you to pay the transfer taxes and sponsor attorney fees which are typically the seller’s responsibility. A good buyer’s agent would also tell you that closing costs are negotiable, and that you can request the sponsor to cover various closing costs as part of your offer. The worst mistake you can make is to put an offer in on a new development with a completely useless buyer’s agent who doesn’t bother to inform you that the sponsor will assume that the buyer will pay the transfer taxes and their attorney costs. So without any knowledge of whether this is typical or negotiable, you end up paying almost 2% of the purchase price in transfer taxes plus several thousand dollars of the other side’s attorney fees. Unbelievable but this is a very common first time home buyer mistake in NYC that we’ve seen happen to countless new buyers! No. Once first time home buyers get the idea that they can take home some of the commission themselves, they’ll sign up with the first discount broker they find. This is one of the most dangerous first time home buyer mistakes to avoid in NYC because a broker who openly discounts will be hated by the wider broker community, and this lack of cooperation could seriously undermine your chances of securing a home. Think about it, there’s a reason that discount brokers aren’t more successfully in a place like NYC where there are 50,000 licensed real estate agents. That’s because you need the cooperation of other agents to be able to successfully complete a transaction. Listing agents typically search online for the names of brokers they are unfamiliar with. So what happens when they search for the mom and pop discount brokerage you signed up with? They’ll immediately realize what is happening, that you can pay more because you’re getting a rebate, and they’ll actively ignore the discount broker in the hopes of selling it to someone else. Why would they work with a discount broker who has most likely been trash talking the traditional brokerage community and loudly advertising that they’d work for less? To traditional brokers who control almost all available listings, this feels like cheating and literally biting the hand that feeds them. Remember, it is traditional listing brokers who have secured the seller paid commission in the first place! You might get some attention if the property has been on the market for ages and you are the only possible buyer. Even then they’d try to get in touch with you directly. Is all of this trouble worth it? If you’re getting ignored by listing agents because of the shady discount broker you signed up with, what does it matter how much of a rebate you’re getting? The only way to get a rebate without negatively affecting your prospects is to work with a traditional, well regarded real estate broker who has agreed to discreetly provide you with a commission rebate at close. 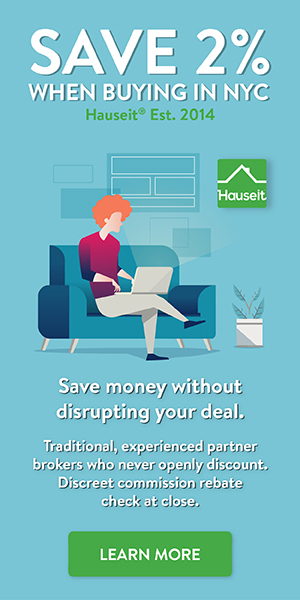 Through Hauseit, we’ll pair you with a highly rated, brand name REBNY Member Agent who will not only provide you with great advice, but who will also discreetly hand you a rebate check at closing. It’s truly the best of both worlds! Absolutely. You have much more negotiating power with sellers of aged listings, typically defined as properties that have been listed for 90 days or longer. Often times, it will be obvious that you are the only bidder. This will be a huge advantage as you’ll be able to actually negotiate with the seller and can avoid having to compete in a best and final offer process. One of the most painful first time home buyer mistakes to avoid in NYC is only focusing on new listings that hit the market. If a new listing is priced right, it’ll usually attract many visitors and bidders. As a first time home buyer, you’ll most likely be purchasing with a mortgage and will want a mortgage contingency. As a result, you’ll be competing with bidders that might not need a mortgage contingency or can purchase all cash. It’s extremely demoralizing to participate in one auction after another and to get beat out every time. A good buyer’s agent will advise you to look for older listings that perhaps were marketed too high originally and now are desperate to sell. A veteran buyer’s agent will also inform you that you can put offers in on multiple properties as offers in real estate are not binding! The transaction only becomes binding for you after you’ve chosen a property to purchase and signed a contract. That means you can have offers accepted on multiple properties, and even negotiate contracts on multiple listings before deciding to sign one of the contracts!